Mark comes back to PA for fall break every October. Weather permitting (and sometimes weather NOT permitting) we forage, with varying degrees of success. This year we rocked the world of wild foods with more good luck and delicious edibles than I dreamed of. First stop is always the chestnut tree. The past few years have been bleak: four-legged fauna has beaten us to the nuts. But this year we found some still on the tree, not enough for a meal, but plenty for garnish. We'd had snow the night before, so I figured mushroom season was over, but we decided to check one of our standby trees just because. After all, we were in the 'hood. At the base of the oak was the biggest Chicken of the Woods I've ever found. We were giddy with excitement, despite the fact that snow had turned to rain. Hoping to continue our lucky streak, we checked a spot where we'd found Hen of the Woods (Grifola frondosa) in the past, although not for the last two years. We picked three large Hens, leaving two behind because we just didn't need anymore. Maybe they'll make someone else as happy as they made us. we continued on to the evening primrose (Oenothera biennis). 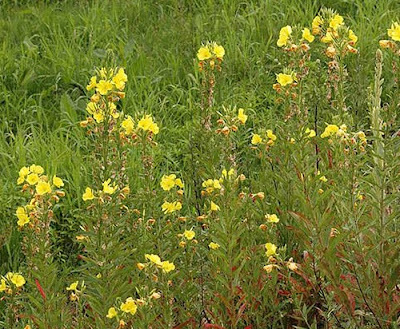 Evening primrose is a biennial with a root that's edible in fall of the first year & early spring of the second. By the time the plant sends up a flower stalk (in summer of its second year), the root is tough and stringy. This is a plant that runs rampant in fields and along roadsides. We only harvested a few, since we didn't want to waste it if it turned out not to be delicious. Our final stop of the day: Shohola Lake. This summer (on a frustratingly unproductive blueberry expedition) we'd seen loads of hopniss (Apios americana). Why doesn't everyone grow this plant? Gorgeous, fragrant flowers and edible tubers...come on people! We arrived at the lake, shovel in hand, and parked by the shore. Technically this was a no parking area, but no one was fishing on this cold, wet day and Mark said he'd never seen a ranger here. Less than 2 minutes after we located our first clump of hopniss the ranger pulled up, walked over, and asked what we were doing. Mark had dropped the shovel in the tall grass and moved away, to re-direct the ranger's gaze. I explained we were looking for mushrooms and after a brief chat he went back to his vehicle. Didn't leave right away, but eventually. We figured he'd seen our orange vests & hats (it's hunting season, after all) and since we weren't wearing licenses he'd come to check us out. The soil at the lake could not possibly have been rockier. But we managed to dig up a few decent sized tubers. Again, we didn't get greedy, since we didn't know yet whether the hopniss would be tasty. 3 pm and our bags were full. Lots of cooking to do before the evening meal...but that's another post! It was indeed a great day in the wild! And in the kitchen. I also brought some KY paw paws from a ramble last week and Ellen made an amazing steamed pudding with the spice bush berries. About the digging: we took only a few and there were vast stretches of dry hopniss vines! I should feel guilty, but do I? Guess. Wow! A foraging day to remember--congratulations! It's been a great fall for wild edibles, plants and mushrooms alike. Kind of makes up for the lousy tomato season and cool rainy June/July. I never heard that common name for Apios americana! Can't wait to know what you think of the tubers - I've only tasted them experimentally. So, SO jealous of the hens & chicks of the woods. Sara, We each held back a few of the smaller hopniss tubers, exactly for that purpose! I've grown the plant in a container for a client (purchased at Gowanus Nursery in Brooklyn) and after digging the wild tubers in stony soil, I've decided containers are the way to go! Also planning the Apios for East Houston! Glover Perennials stocks it. I am wild with envy. Marie, I've never been to Glover but after reading your posts, I'd love to go. It's just so far out on the island. I got my Apios at Gowanus Nursery...a little closer to home! and yes, serious mushroom envy!